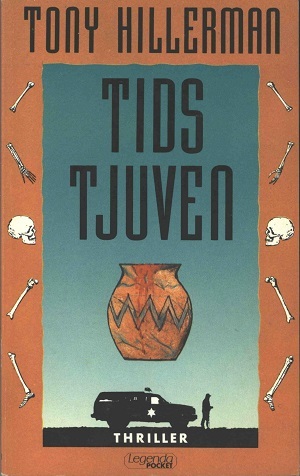 The is the second Swedish paperback edition of A Thief of Time published in 1991 by Bokforlaget Legenda AB in Stockholm, Sweden. This edition is the paperback reissue of the book for the Legenda Pocket Thriller series. A Thief of Time is the eighth Navajo Mystery novel by Tony Hillerman. The main characters Joe Leaphorn and Jim Chee join forces to investigate two missing items: a female anthropologist and excavation equipment. This edition was translated from Tony Hillerman's original text in English to Swedish by Karl G. and Lilian Fredriksson. The cover design is by John Eyre. The cover contains the images of a blood filled ceramic vessel, a police vehicle, and a policeman with skull and leg and arm bones framing. Format: Paperback, 17.8 x 11 cm. Binding: Full-colored paper covers with the author, a skull, the title, and the publisher's logo printed vertically in black on the spine.